I hope SCS put it into their game themselves. This rule change only lifts certain restrictions over things that are already in the game, for example putting a 3rd trailer after a double-trailer. What you linked contains custom content. Content that is not originally in the game cannot be save-edited. Hope I explained it well. It's one or the other. Either you edit your save yourself, or you get an Addon/Mod that do it for you. I got a mod called "ETS2 New Trailer Configs By Smaen" that allowed me to get a triple trailer. Don't forget to check whatever you do is allowed by the rules. Not a stupid question at all. You need save editing in order to get triples. You might, however, find Workshop Addons/Mods that does it for you. urgent Obnoxious, loud and earraping car sounds has to be removed. I didn't really have the most pleasant time on TruckersMP in 2018. As much as the negative things are much more noticeable, I can't really think of anything that was very positive. All I can look back to is neutral and negative things. Let's hope 2019 will be better. Do we have any alternative download links for these? Without pop-up blocker you get ads, and with pop-up blocker/adblocker the links don't seem to work properly. I love when you already own stuff in a Steam bundle, you get the DLC you don't have for such a low price. 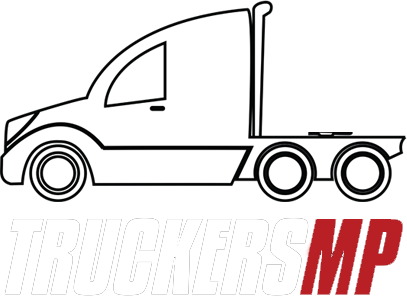 Are you talking about convoy events ran by TruckersMP Staff? Because if so, usually there's just too many players in the convoys and it gets difficult to reach high speeds. But either way, you only going max 50 mph is fine. There are also temporary rules in these convoys, for example no overtaking. But of course there are always people breaking rules. Anyway, I think you'll be fine driving 50 mph. You can also not use F7 + Enter with double trailers. Even if you're driving in Italy, it will teleport you up to Denmark. Fix for trailer stability ? 25km/h in a 90º turn is still too fast in some cases, especially if you have a trailer with heavy cargo. You should be going around at max 15-20km/h. But since we're talking about the console command about trailer stability, you don't need it. If you use the regular settings for trailer stability you can go quite fast in most curves. There is no need for the g_trailer_stability console command if you're going to drive properly. I've played with both the lowest and highest setting for trailer stability since 1.32 patch. It works, if you drive the appropriate speeds in corners and hills. I think this rule is great, because this forces people to drive more carefully and not so recklessly fast. People just got to remember that this is a simulator game and truckersmp is simply a mod that allows people to drive together. Euro Truck Simulator 2 is not a racing game with trucks, it's a game for as realistic driving as they can provide. I'd suggest that they allow console commands like g_trailer_stability in Europe #4. But otherwise I think this is a great rule as it directly supports people who want to play the game like it was meant to. I don't get this. I mean, sure it may be a good idea on roads like Calais - Duisburg to reduce the amount of players driving there, but Luxembourg? Metz? Groningen? Kassel? There are so many cities and roads here that does not need this kind of restriction. Why do you want to add unnecessary restrictions onto your players? Before the double-trailer restrictions was even added players had absolutely no problems driving these double trailers in the now restricted areas. At least remove this restriction from certain servers, preferably from Server #2. Like, are you intentionally trying to make it a bad experience on your multiplayer mod? There are plenty of suggestions regarding this restriction of double-trailers, but none of them have been reviewed. Not a single one before this update. Do we not have any say in the mod that we are the playerbase of? Does the community get no say in anything? Like I stated in my double-trailer suggestion, it's rude and toxic to auto-kick players for no valid reason. Disallowing double-trailers in central Europe, or at least around C-D road, makes absolutely no sense. It's literally just a restriction to ruin the experience for your users. Before you try to counter my argument; But people can get stuck and cause traffic jams? Sure, but so can single trailers. Yesterday I drove my B-Trailer through Berlin, I never saw a double-trailer have any issue around corners or out of compounds/service stations. The only ones who had issues were single trailers trying to cut corners. With cargo they get really heavy!? Sure, but so are the Heavy Cargo DLC trailers? And we've never had any issues with these that single trailers haven't had in the restricted areas. I'll say it again, I can't see any logical reason(s), backed with facts, behind this restriction. Another reason to allow double-trailers is that, just look back on how it was when the Scandinavia DLC came out. Bergen - Oslo were just as filled with players as Calais - Duisburg is today and double trailers were working just fine there. Currently 2,757 players on EU#2 and this is how it looks at the moment. You mean it's impossible for double-trailers to visit Osnabrück with 24 players? I can come back during peak times and write down the numbers again. The only cities that I truly believe should not have double-trailers are Calais and Duisburg, especially Duisburg. It will be impossible for the double trailers to leave the service station. Well, it already is impossible to leave the service station in Duisburg, especially since they made it even more narrow in patch 1.32. But look at these numbers, why would double-trailers be an issue in a city with 30-40 players in them? In Cities most players will be in no-collision zones. Most cities except Duisburg and Calais got no issues with their service station unless there's some dude fallen over refusing to teleport away or a single person blocking, but that happens even without the double-trailers. Duisburg (City) - Congested (63) Calais (City) - Congested (58) Brussel (City) - Heavy (30) Rotterdam (City) - Moderate (27) Luxembourg (City) - Moderate (25) Frankfurt am Main (City) - Moderate (24) Osnabrück (City) - Moderate (24) Liège (City) - Moderate (22) Lille (City) - Moderate (20) Amsterdam (City) - Low (18) Dortmund (City) - Low (17) Hannover (City) - Low (16) Düsseldorf (City) - Low (16) Kassel (City) - Low (10) Mannheim (City) - Low (10) Bremen (City) - Low (10) Köln (City) - Low (7) Groningen (City) - Low (5) Magdeburg (City) - Low (5) Again, it just feels like you guys are intentionally trying to worsen the experience of TruckersMP. EDIT: EU#2 is almost full, currently 3,892 players. Duisburg (City) - Congested (62) Calais (City) - Congested (75) Brussel (City) - Congested (48) Rotterdam (City) - Congested (41) Luxembourg (City) - Moderate (21) Frankfurt am Main (City) - Moderate (21) Osnabrück (City) - Moderate (27) Liège (City) - Moderate (20) Lille (City) - Heavy (32) Amsterdam (City) - Heavy (33) Dortmund (City) - Moderate (21) Hannover (City) - Moderate (27) Düsseldorf (City) - Heavy (31) Kassel (City) - Low (15) Mannheim (City) - Low (10) Bremen (City) - Low (13) Köln (City) - Heavy (33) Groningen (City) - Low (8) Magdeburg (City) - Low (15) I still see no real indication that would suggest not to allow double trailers in any of the cities other than Duisburg and Calais (City, not dock). Maybe Brussel and Rotterdam, or just the road in between those cities.